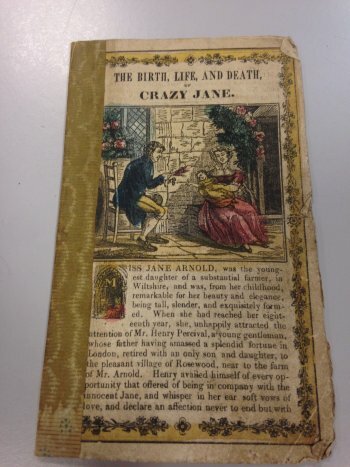 “The Birth, Life, and Death, of Crazy Jane” is from a genre of street literature called chapbooks that was present in Britain from as early as the 17th century through the 19th century. The name chapbook originated from the people who sold them—chapmen. 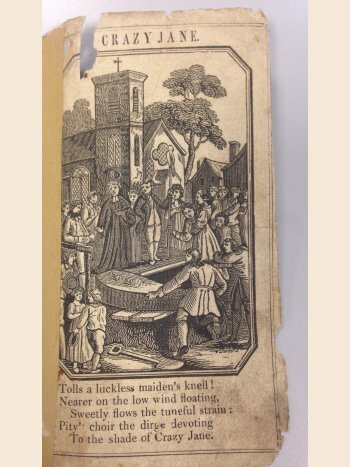 Chapmen were travelling merchants who would visit towns far from the cities and bring small necessities and luxuries with them—chapbooks included. The books were small and easy to carry in large quantities, as their pages ranged from only eight to forty on the high end, and they traditionally had no covers to make them bulky and heavy. 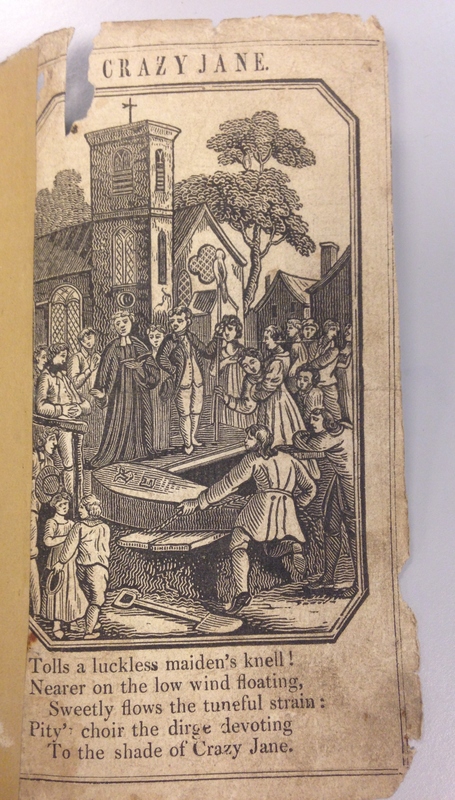 Due to the low price of production, chapbooks could be sold for only a penny, making them accessible to the poor. As the percentage of literate people increased, those with rudimentary skills were able to practice reading by purchasing a chapbook. In addition to having the right price point for lower class citizens, the stories themselves were typically based off popular folk ballads, so the readers were able to understand what was happening, even if they did not understand all the words. Each chapbook was produced entirely by hand. Publishers typically chose to employ women and children because they were cheap labor and would work long hours. Making a chapbook began with printing the images and words on a single piece of paper, which was then folded down into the correct size. From there, the pages were sewn together down the center crease, and the edges were cut apart to make it readable. The images on the front page and throughout the book were made from hand-carved woodblocks and stamped onto the page. Sometimes the publisher would choose to have the images hand painted, which would more than double the price of the book. “The Birth, Life, and Death, of Crazy Jane” is the tale of a farmer’s daughter who falls in love with a man who abandons her. After he leaves for the West Indies, she discovers she is pregnant, and has an abortion. After the procedure, she goes mad and is found dead by the townspeople in the grove where she used to meet her lover. Five weeks later, her lover returns and commits suicide on her grave, where he is then buried. This chapbook is odd in that it contains a shortened version of the original story by Sarah Wilkinson, followed by three different ballads about Crazy Jane. The second ballad in the chapbook, which was written by G.M. Lewis and composed by John Davy, seems to have been written before Sarah Wilkinson began her career as a writer. Based on this information, it is estimated that this chapbook was published sometime in the early 1800’s.